To those not living there, it may seem an arduous drive to Delhi-110032 in Shahdara, an area not really known for its gastronomic greatness. But then that was before East Delhi's business district became home to the uber-luxurious Kempinski Ambience Hotel. 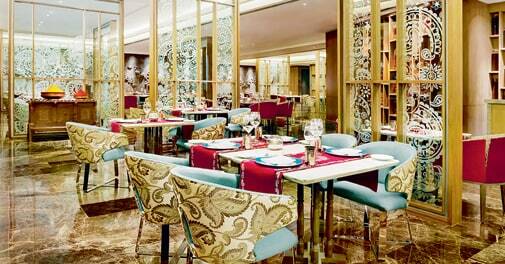 The high towers here showcase the best of the decadent interpretations of Mughal and Avadhi cuisines in the city. The gastronomic feast that unfolds at the Kempinski's Indian cuisine restaurant Dilli 32, named after the area pin code, is delicate in its presentation of heritage dishes created in its open kitchen's tandoors, tawas and handis. We recommend you begin with the shahi galawat ke kebab, medallions of lamb minced and marinated into a silken-like pate, and served on golden parantha disks. Though this may be just a starter, it can hold its own even when faced by the worthy main course of the nehari gosht. Warm spices add depth of flavour sans chilli heat to the slow-cooked shanks, perfect for a cooler autumn evening, in contrast to the rampuri ishtew's white gravy - which is light on the palate and best for lunch on a warm day. Interestingly, even meat eaters are likely to swoon over the vegetarian offerings at Dilli 32. A case in point is the lush shakahari kheechra, which constitutes rice, pulses, vegetables and spices simmered to a buttery, warm comforting one-di sh meal. Or you may want to try the gucchi zafrani, rare Kashmiri morels in spicy gravy best paired with fresh-from-the-tandoor Kashmiri naan. You may pore over the dessert section at the end of the feast, but if you have to order any one thing, it should be the green mirch ka halwa - a bell-pepper-meets-sweet khoya dish that deserves a standing ovation. Go on, lick your digits, no one is judging.